It’s no secret that I love the beach. I don’t even mind the sand all that much because I’d rather have a sand mess then no sand in my life at all. With that said, it is a pain to get all the kids in the car when they are covered in icky sticky sand. They rinse off in the ocean before we leave, but have to walk through the whole beach again, wet, to get to the car. Wet. sand. mess. 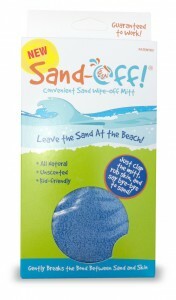 I recently got to try out a cool, unique, product called Sand-Off! Each Sand-Off mitt has an all-natural, talcum-free patented powder formula infused, so you only use what you need. It works for about 40 beach trips and then you can reuse it for household cleaning or whatever you want. 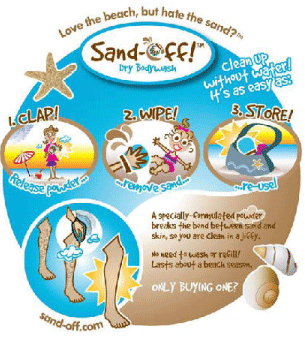 It fits on just like a glove – give it a clap – wipe and the wet sand comes right off your body! It works even when you are coated with sweat and lotion, unlike baby powder. Kids + Sand = Hilarious and cute photos. Share a beach photo thru the tab on their wall that shows why you need Sand-Off for a chance to WIN weekly! Does that photo above explain why I need it? ~ x3 kids! Be sure to check-out Sand-Off’s sidebar ad —-> 20% off code! I was provided this product for review. All opinions are my own. This giveaway will end on Aug 13, 2012 at midnight EST. Winners will be drawn via rafflecopter. Once a winner is drawn I will contact them and they will have 48 hours to reply before I draw a new winner. Giveaway is open to anyone in the US & Canada and you must be 18 years of age or older. Giveaway not affiliated with Facebook & I release them of liability. Winner will be posted in the rafflecopter widget. sandoff would be great for little boy feet!! Would love to have Sand Off for when we go to the beach. No pictures but I do live on an island that is nothing but sand and Sand-off would make my life easier. This is great! Nothing worse than driving home 2 hours from the beach all covered in sand, and having to clean the car the next day! I tried a different product when we went to the beach last year that was similar to talc with a powder puff you used to dust off the sand. Can't say I really liked it since the puff didn't really get all the sand off by itself. It also came in coconut scent, which is the ONE smell I absolutely dislike in anything! It wasn't my idea of a good solution. I like that this is more of a mitt with talc. I think it will be much more efficient and I'd love to try it! Sand off would make my life sooo much easier!! My kids love playing in the sand and clean is such a pain in the but! We live in MN, and we spend a lot of time at the lakes in the summer, so this would come in handy. We could use this! Dh hates sand sticking to him! Don't have any pics though. I tend to leave my camera behind when we are at the beach because I'm afraid of it getting ruined. I have a few on my phone but most aren't with dd covered in sand! Yes, this would make our trips to the beach much cleaner! I am super ready to give SandOff a shot! My van is always covered in sand from the river, the beach and the park! This giveaway couldn't have come at a better time. We've made quite a few beach trips this year and trying to get wet, stuck on sand off my near 3yr old is a huge chore. this is awesome!! We have spent almost all summer at the beach and each time we bring it home with us. Sandoff looks like a great product. We could sure use it on our Car. cruise next year! This is a great idea - thanks for the giveaway! This is why I like the beach in theory but not in practice! I NEED sand off! LOL I hate dirt! :) Sounds super cool! 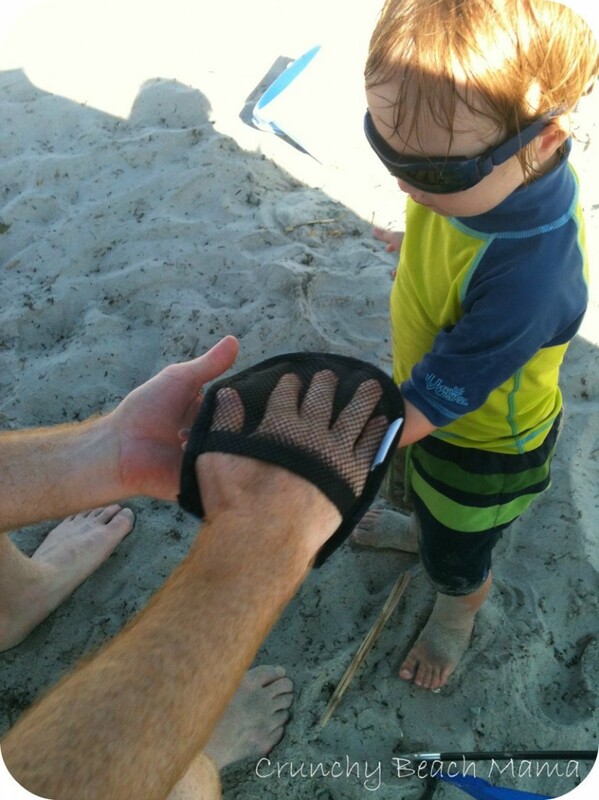 It would make my lifer easier, with my 3 & 5 year old grandsons we always seem to bring the beach home with us! This would be so handy for our beach trips! We have a sandbox and my son tracks in so much sand, this would really help with that. When my Grandkids are at the beach, it will sure help. We have a beach trip coming up at it would really help us to not drag sand back in the house. Woo Hoo! No More Sand! Sand-Off would be awesome to cut down on the amount of sand in my car! I love going to the beach. This would be great. Thanks for the gieaway. 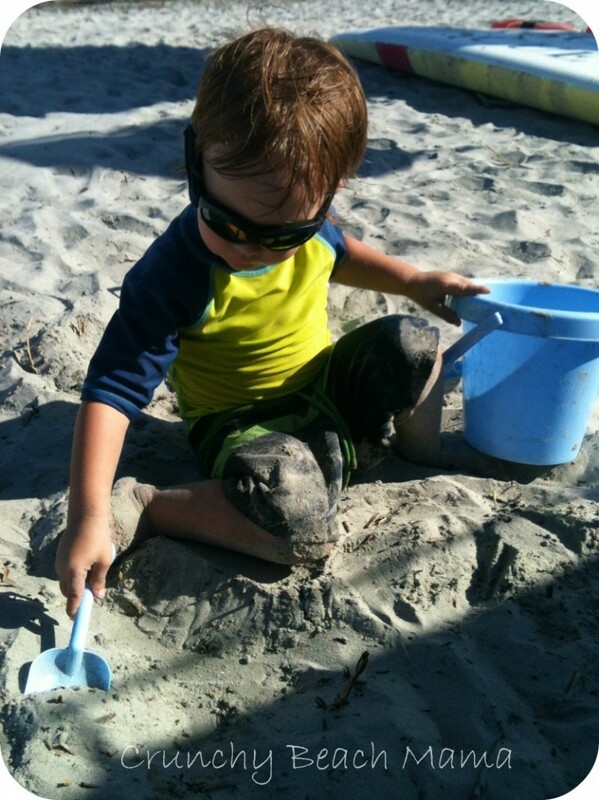 My kids love the beach and the sandbox, so this would make clean-up so much easier! I don't really enter photos in contest of my kiddo, but we live close enough to the beach that we visit frequently, so this would be helpful when it's warm enough to play! When we drive our semi-new van to the beach, I swear I see tears in the hubby's eyes. Sand in the van means taking it to get detailed...so the more sand we can get off our bodies, the less he'll cry. Maybe. I don't have photos or facebook. I have a photo on my page of when my kids were playing in dirt.....lol. Does that count???? How neat! We go to the beach often in the summer so this would be handy to have! My son loves playing in the sand, this would make cleaning him up much easier. And keep my house sand free too, what wonderful experience that would be. I'm sure I do somewhere... lol. I live at the beach and we don't even have dirt, just sand everywhere! This would be so useful! This would be good for my grand baby at the beach on the lake..
We live about 5 miles from the beach so we go whenever we can. Sometimes I wonder how there can be any sand left after we leave as it seems that half of it ends up in my house! I live 20 minutes from Galveston, so this would be perfect for my granddaughters!